During the weekend the Advanced Control Team (ACT) went to Denmark to launch a roll controlled version of the Cansat V7 rocket. This rocket has been developed for around 2 years and aimed to demonstrate roll control of a sounding rocket. In order to fly this actively stabilized rocket, the first ever within DARE, the team contacted the Danish Space Challenge (DSC) and an extraordinary launch day at Borris Firing Range in the west of Denmark was organized. Two launch windows were offered, the first on Saturday from 17:30 till 20:00 and the second on Sunday from 9:00 till 12:00. On Saturday all preparations for the launch went smoothly. The hydraulic launch tower provided by the DSC was set up and some last checks were done on the rocket. Unfortunately the main control unit of the ACT board of the rocket broke down just an hour before the launch window opened. In order to fix this issue, the 144 pin microcontroller needed to be exchanged, which was not possible on the launch base itself as this requires advanced electronic equipment. During the night, the board was completely resoldered and proved its functions in the early morning hours of Sunday. Afterwards the ACT Software was flashed on the new board and everything worked fine. The team left around 8:00 in order to launch the rocket before the launch window closed again at 12:00. In order to make this window the rocket in the end needed to be assembled within 3 hours, which was deemed to be possible if no major issues occurred. An unexpected issue with the TTL-RS232 converter, which was caused by the old board during the breakdown on Saturday delayed the software part by the rocket and ultimately delayed the whole assembly of the rocket that the team could not assemble the rocket before the closure of the launch window. As the 12:00 deadline was a hard deadline enforced by the military, the launch campaign ended unsuccessfully without a launch of the Cansat V7S rocket. The next launch opportunity for the ACT will be during the DARE launch day at ASK t’Harde on the 20th May. 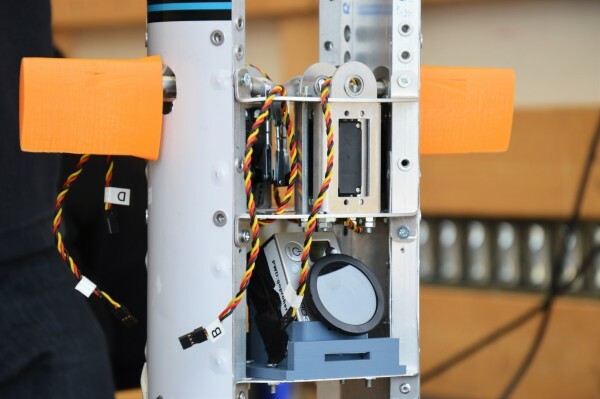 We are looking forward to see the Cansat V7S rocket to fly and prove that DARE is able to cont-roll. Stability Augmentation System. It contains canards, the suspension for canards, actuators and gearing system between them. It were very nice to have you guys visiting. I very much hope that you will come visit us again some day. We have still to see your rocket fly, even though you put up a very heroic effort during the night between Saturday and Sunday, and also during the launch window. As I heard the story about when, during the wee hours, you were done assembling a new ACT board, I don’t even think there were time to have left earlier for Borris. I felt very bad about having to deliver the bad news at three to twelve.